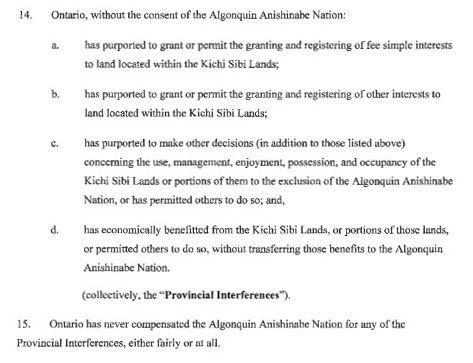 Documents circulated Dec 6, 2016 by the City of Ottawa’s planning department point to Windmill Development Group’s leasing of lands on Chaudière and Albert Islands, while a Dec 7. statement of claim by Kitigan Zibi Anishinabeg First Nation, on behalf of the larger Algonquin Anishinabe Nation, names Chaudière and Albert Islands as part of a legal challenge at the federal and provincial levels. Documents created by the City’s planning department were circulated on Dec. 5, 2016 to a group of about 40 citizens in the city. They constitute the city’s draft approval of Windmill’s site plan application for 3 and 4 Booth Street. 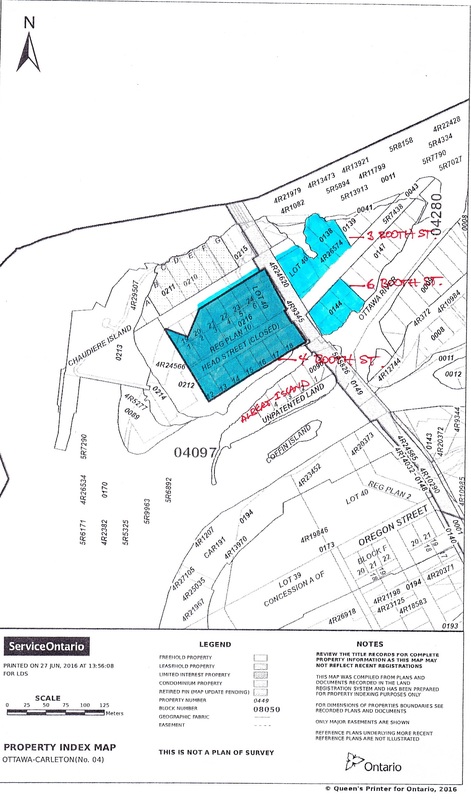 Document 1-Location Map produced by the planning department purports to describe where 3 and 4 Booth Street are located. Due to the lack of solid information on this map, and based on his extensive research into land issues on Chaudière and Albert Islands, local historian and researcher, Lindsay Lambert, wrote to the planning department seeking answers. “The Region 03 Assessment Roll, compiled in 2015 for 2016 taxation, provides a comprehensive description of the addresses and other properties on the two Islands. 3 Booth Street is on the east side and is comprised of Building Lots 7, 8 and part of Lot 9, with parts of Head Street, Union Square and Chaudière Street. Lambert’s research includes a map he obtained from Service Ontario (see below, with handwritten markings). It shows a very different configuration for 3 and 4 Booth Street than the map the planning department is circulating. This is backed up by the Region 3 Assessment Roll, which sets out location and ownership of these parcels of land. Even so, the developer has been involved in pre-sales of its Kanaal condo project on Chaudière Island for the last year. No construction has begun [construction cranes on Chaudière Island are part of a Hydro Ottawa expansion project], and at least one potential condo owner in Ottawa is warning other buyers to be wary of purchasing a Kanaal condo. She suggested that Lambert contact Windmill Development Group directly for answers on this. Lambert’s research into the questions of colonial “ownership” of lands on the islands includes the following, which he shared with Ms. Hamlin in his letter. On August 25th, 1854, the Government of the Province of Canada approved an Order in Council reserving Chaudière, Albert and other Islands for Public Purposes, along with an area of the Ottawa shoreline. It states that they may be disposed of when not required for Provincial Works, and leasing is specifically recommended. The Islands were surveyed into Hydraulic and Building Lots, which were made available from 1857 to businessmen who would immediately put them to industrial use. They were not offered for speculation. (Harnessing the water power was considered to be for the greater public good.) The Hydraulic Lots were the most important, and were leased by the Crown for the construction of mills. These leases were “forever,” renewable on a 21 year basis, and remain in force as long as the lessee adheres to the conditions: They must pay their rent, maintain their infrastructure so as not to interfere with their neighbours, and operate a mill. (Domtar closed theirs in 2007.) Furthermore, the Crown can “take them back at any time for any public purpose.” The Building Lots are listed separately, with minimal description. They were offered for $10.00 each, on the condition that an industrial building to a certain value is constructed within a year. If not, the Lot reverts to the Crown and the person loses their deposit. There is nothing to indicate that they were being sold outright. Sir John A. Macdonald wrote a letter on July 15th, 1869. He states that the first industrial occupiers, Messrs. Perley and Pattie, have a “Licence of Occupation,” that the area is Crown Land, “and was before the first of July, 1867.” There was a legal question in 1902 as to whether the Islands were under the jurisdiction of the Federal Government or the Province of Ontario. The conclusion is that “the Chaudière Islands, slides and Hydraulic Works connected therewith, except such parts as had been granted by the late Province of Canada; and also the entire water Power of the Ottawa River flowing past the Islands, are the property of the Dominion of Canada.” According to Sir John A., there were no pre-Confederation grants. The Federal Government took back an area at the eastern end of Victoria Island in 1926, for the Royal Canadian Air Force aircraft repair depot. They followed the Hydraulic Lot rules, giving the occupant 30 days notice to clear their lumberyard and vacate, with nothing owed by the Crown. The interesting part is that there are no Hydraulic Lots there, just Building Lots. The Hydraulic Lots on the Chaudière Islands remain Crown Land. Domtar claims that they own the area of the Building Lots. This issue is easy enough to resolve. All they need to do is produce their original land deeds, showing that they own them all in fee simple. If they can’t, it’s still Crown Land. Will the City of Ottawa please look into this? We all need to know. 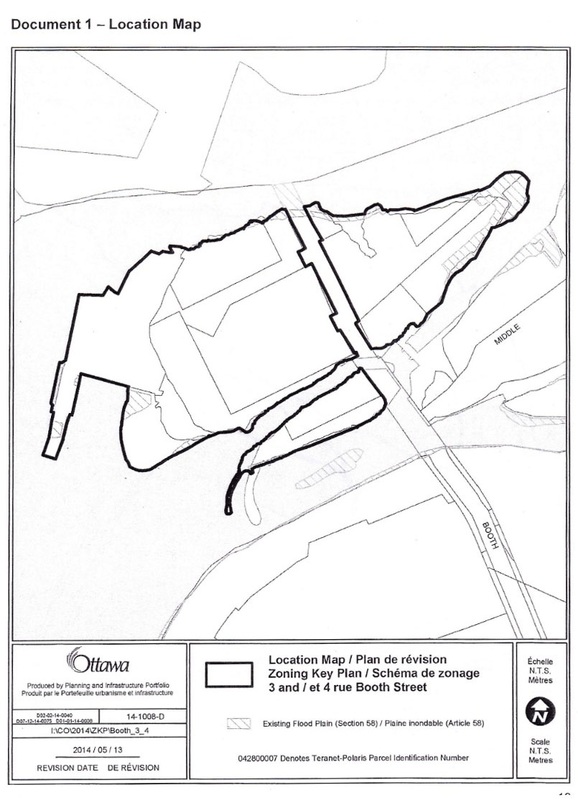 As a small note, your staff describe the proposed Zibi site as “former Domtar lands.” This isn’t true. According to the current Ontario Land Registry Office records, the only things registered to Windmill are a five year lease and a sublease, both from Domtar. Windmill owns nothing.